Approximately 64% of traffic incidents in the United States involve cell phones. Many experts are referring to this problem as an epidemic because it is so prevalent in our society. Teens across the nation are learning to drive and form habits that will last the rest of their life. They need to be instructed on the dangers of distracted driving from the beginning to help stop the problem and parents can play a key role in this education. Here are three things parents can do to help prevent their teen from texting and driving. Set a good example. Many parents have the attitude of “do as I say, not as I do”, but experts have always found that kids learn more from an adult’s example. When you get a text while driving, what do you do? Remember, your kids are watching. Most states have passed laws dealing with distracted driving, especially with the use of cellphones. Simply telling your teen not to text and drive is not enough. You must teach them what to do instead. Here are some ways to deal with receiving and sending texts when you’re driving. If you have someone in your car, you can have them read it to you and respond. Pull over to the side of the road before looking at your phone. Wait until you get to your destination before worrying about your messages. Remember that you must practice what you preach. These are all great options for dealing with texting and driving, helping to make sure they stay safe behind the wheel. Education is key to preventing behaviors. There are plenty of resources available to show the consequences of watching a cellphone instead of the road. Swerve Driving Schools has resources that include videos of what could possibly happen, statistics, and curriculum that teaches the laws involving cellphones. The dangers of texting and driving are real. Every look at the phone is estimated to take five seconds. Whether it is freeway speeds or driving through a neighborhood, looking down for even a couple of seconds can have serious consequences. A child running in the road, another driver changing lanes, traffic slowing or stopping are all common occurrences that require vigilance on the road. Reinforcing these teachings at home is vital to teens remembering them. Set specific rules for phones in the car and enforce them. Check up on your teens. There are several ways you can make sure that your teen is being a safe driver. Ask them if they text and drive. Check their phone when they get home. 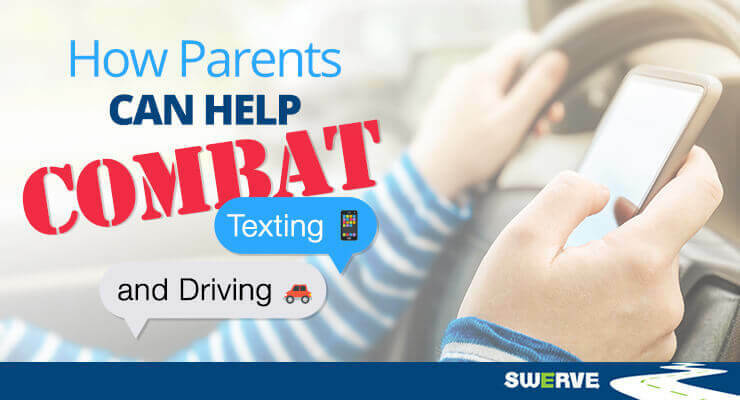 Use parental apps that block texting and driving. Watch them if you pass each other on the road. Parents feel like checking up on their teen breaks trust and ruins the relationship. Remember that your job is to be a parent and that you are teaching them correctly. It is better to make sure your teen is doing what’s right behind the wheel than getting a call that they have been hurt or hurt someone else through neglectful behavior.